416-464-9124 or 647-667-9090 and start packing! 1) WE HAVE BUYERS IN WAITING We have over 400 buyers in waiting in our database. Your home may already be SOLD! In fact, we sell over 40x more homes than your average agent. Because we sell more homes, we can do more to sell your home! We sell our homes for 3% more in sales price when compared to your average agent. This means real dollars in your pocket! As per Toronto Real Estate Board\MLS, the average agent sells a home in 69.33 days while our average time for selling a home is only 19 days! 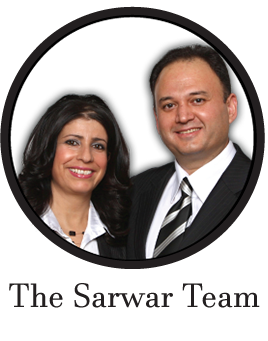 With “The Sarwar Team’s” proven track record, your home is not only more likely to sell but, it will sell for more money and in less time! According to MLS statistics, only 6 out of 10 homes sell during their listing period. Compare that to 9 out of 10 homes listed by “The Sarwar Team” that sold before the end of the listing term. 6) THERE IS NO RISK - WE OFFER PERFORMANCE GUARANTEES TO OUR CLIENTS!